Spare a thought for Indian business schools' Class of 2013. These young women and men will be heading out into a world where financial well-being is not guaranteed, the global economy is epileptic, and the view from a management perch is vertiginous. "The bigger question is, how relevant are we in a changing world?" asks Ajit Rangnekar, Dean of the Indian School of Business in Hyderabad. "How do we move from producing MBAs for financial institutions to producing talent that attacks major problems in society?" Students now think about meaningful careers, not just the instant gratification of a fat pay cheque. "I tell my students I care about how happy they are long-term." Rangnekar says today's young managers have the chance to make money while doing something good. "For example, skilling five million people is a great business opportunity, or bringing out the value in SME manufacturing… You need one JRD (Tata), you need one Muhammad Yunus, you don't need a million of them." The greater challenge, Dean Rangnekar feels, is equipping young people to deal with corruption. "How do you identify ethical issues? How do you qualify them? How do you negotiate them? We have to create a community of corruption-busters; then we will begin to see real change." That ought to strike a chord at the Amrita School of Business in Bangalore that mixes spirituality with management. Our annual bestseller B-school rankings hold a surprise this year: IIM Bangalore has dethroned its Ahmedabad sister, and the reasons why are very interesting. In fact, IIM-A is No.3. 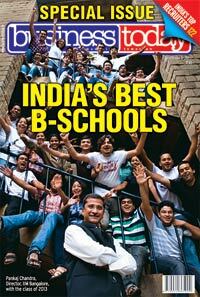 The news to note is that seven of the top 10 slots have gone to IIMs; quality obviously tells. In other surprises, BT reporters uncovered a trove of heartening stories like the Department of Management Studies at Dhanbad's ISM, and the growing number of law-and-business courses. You will enjoy reading the spirited debate between a senior banker and the head of IIM Indore on whether business schools are losing sight of what hirers want. Aware that our rankings are taken very seriously, we also worked with our partner Nielsen to thoroughly revamp our methodology. The objectivity and rigour of our survey, which covered 1,732 respondents across 13 cities in five categories, is growing by the year (this is the twelfth time we have ranked business schools). Take the Indian Institute of Foreign Trade in Delhi, which has leapt from No. 17 to No. 11 and then No. 7 this year, showing consistent improvement, or the Symbiosis Centre for Management and Human Resource Development in Pune, which vaulted from 37th to 12th. Business Today also very proudly presents India's most sophisticated and comprehensive online business-school package. Our website is a cornucopia of rich content, from exclusive videos of faculty and students, wonderful stories narrated by well-known B-school alumni, and information-packed videos of the Top 10 schools. Go to www.businesstoday.in/bestbschools for a deep dive. As if this collector's edition were not "supercalifragilisticexpialidocious" enough, we also have our annual survey of India's top recruiters (who says we don't give our readers the very best?). And there is much, much more to savour. Gorge yourself.